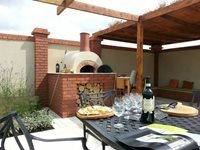 British celebrity chef Jamie Oliver has his own line of wood fired ovens, which he considers the ultimate foodie must-have. The line includes the compact dome60, and Valoriani kit ovens that can be used for custom residential installs or commercial applications. Sometimes being unique borders on being odd. Celebrities naming their children things like Suri, Apple or Willow. A woman wearing a multi-colored dress and a fur coat to a holiday party. You get the idea. But, more often than not, being unique is a good thing. Imagine throwing a pizza party where everyone gathers in your backyard and makes their own pizza. 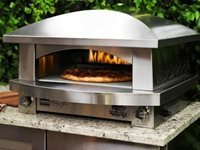 Leave the days of delivery pizza behind with this custom concrete pizza oven. 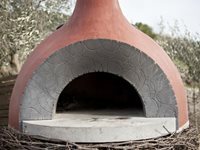 From pizza and bread, to baked goods or roasted meat and veggie dishes, a Mugnaini oven does it all. Based on age old Italian traditions, these simple and efficient ovens are made from the finest terra cotta clay. There are no electronics or moving parts to worry about and food cooks evenly every time due to the combination of conductive heat, radiant heat and convection. 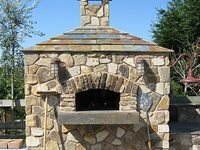 The ovens can be finished in a variety of styles including brick, stone, or stucco to match any outdoor living area.